Will. Trusts. Estate Planning . The Estate Planning process is about you determining what happens to your estate, your assets, your property when you become disabled or when you die. When you take control over the planning of your estate, the estate planning process belongs to you, not the government. If you don’t make those decisions beforehand, you leave the decision to your heirs, the government, or possibly to someone you don’t even like. 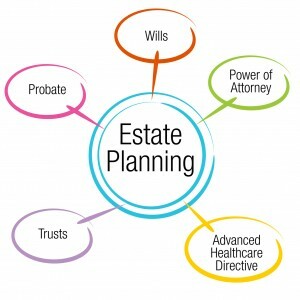 There are five documents which are generally included in the Estate Plan: Trusts, the Will, Power of Attorney, Healthcare Directive (Living Will), Assignment of Assets. Your assets are better protected from the reach of creditors. A trust creates a fiduciary relationship with respect to the trust property. In order for a trust to exist, there must be an intent to create a trust, a valid trust purpose, something of value which is called the trust res, a trustee (someone to manage the trust), and at least one beneficiary (someone who benefits from the trust). A trust can be revocable or irrevocable. If it is a revocable trust, the trustor can revoke (or terminate) the trust at anytime during their lifetime. Irrevocable trusts, once created, cannot be revoked. A “will” is a written document whereby a person disposes of his or her property (e.g., real, personal, intangible property) after they die. If they don’t determine what will happen to the estate once they are dead, either the remaining family members will fight over it or the government will make the determination for them. It’s always better for you to decide what happens to your property. If you leave it up to someone else, you suffer. Will and trust law is governed by the individual states, e.g., California has its own rules, Maine has its rules, and New York has it rules. The rules are different, therefore one-size-does-NOT-fit-all. The definition of a “will” includes amendments called codicils and any other related document, which may appoint an executor (or executrix) or revokes or revises a will. In California, a “formal” will must be signed by the testator (person whom the will belongs to) and at least two witnesses. Sometimes a testator can write up their own will in their own handwriting. This is called a holographic will and does not need to be signed by witnesses, only the testator. Pour-Over Will. Sometimes you forget to transfer your assets to your trust. Hopefully you won’t, but in case you do, the Pour-Over Will captures those assets and you then can determine how to dispose of them through this will. The downside is that a Pour-Over Will is still a will, so the property must go through probate. Contact Francine today for a no obligation consultation concerning more information about trusts and wills.